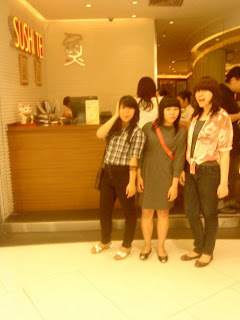 saturday nite, i went to senayan city with manda, agustina, and inez. manda gave me a box of cocobi, shincan's fave snack. i haven't open it. i love it too much until i don't wanna open it. by the way, it was super fun!! i found a super cool gladiator sandal at Zara but i didn't buy it because i've bought an Elle high heels a few days before and my mom would be very mad if i buy that gladiator. 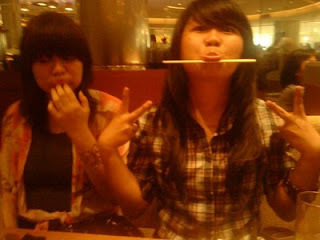 hehe.. i also tried tutti frutti. finally i tried them. :D tutti frutti is love!! i can take my yogurt by my self so i can measure how much i wanna eat. i take my toppings by my self too. 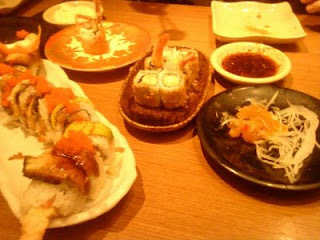 by the way, we ate at Sushi Tei. this one! i couldn't do this. but Agus luckily could do this. she was very happy coz she could to that. lol. tomorrow i'll go to campus to have meeting about new students orientation programs. i hope it won't be long. hehe.. it have to be compact and meaningful. well, at least i hope so. 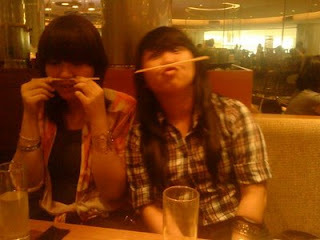 and on wednesday, i'll go to tebet with inez and agus. can't wait!! "Girls are like apples. The best ones are the ones at the top of the trees. The boys don't want to reach for the good ones because they are afraid of falling and getting hurt. Instead, they just get the rotten apples that are on the ground that aren't as good, but easy. So the apples at the top think there is something wrong with them, when, in reality, they are amazing. They just have to wait for the right boy to come along, the one who's brave enough to climb all the way to the top of the tree." by the way, lately i post quotes frequently. so sorry if you get bored. but this one really made my day! i'm sorry for the lack of posts lately. basically i'm a super lazy girl and these days my laziness have become overwhelming. hehe.. i promise that i will post something later. just a quick update for now: i'll have my final exam on 22 of june. oh no.. i don't really understand what my lecturers taught me after mid-semester test. hope this week i can learn all of the materials. by the way, my friend from taiwan, Manda, will come to indonesia on 14 and another one from shanghai, Gerda, will come on 15. wohoo, so happy! let's hang out friends! but after my final exam, okay? don't be a devil, asking me out everyday and left my exam preparation at home. hehe. can't wait to see you darl! PS: i don't know that the template i used before this makes everyone cannot put any comment in my post. i just knew that from venezia lowis, thanks friend! and because i'm not an web designer and i don't really understand html codes, so i decided to change my layout again. 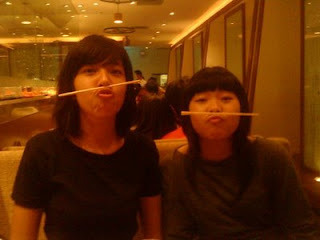 hehe.. btw, visit her blog. her blog is super! "The world ain’t all sunshine and rainbows. It’s a very mean and nasty place and I don’t care how tough you are, it’ll beat you to your knees and keep you there permanently if you let it. You, me, or nobody is gonna hit as hard as life. But it ain’t about how hard you hit, It’s about how hard you can get hit and keep moving forward. How much you can take and keep moving forward. That’s how winning is done! Now if you know what you’re worth, go get what you’re worth, you gotta be willing to take the hits and not pointing fingers, saying you ain’t where you wanna be because of him or her or anybody! Cowards do that, and that ain’t you! you are better than that! Until you start believing in yourself, you ain’t gonna have a life."